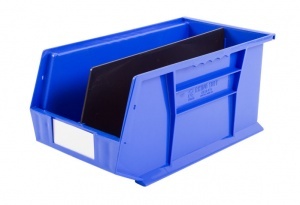 Rhino Tuff Bin Dividers are available for Bin30, 35, 40, 50, 60 & 70. Purchase as single dividers. These dividers are available for Bin30, Bin35, Bin40, Bin50, Bin60 and Bin70. Made from black polypropylene these dividers give additional flexibility on compartment size and allow the splitting of different products within the same bin. The divider fits snugly into the slots already moulded into the bins and the larger Bin50, 60, and 70 have three slots enabling the bin to be split into two or three compartments depending on your requirements. Prices shown are for one divider.